How to Make Coconut Milk — It's EASIER than you'd think! 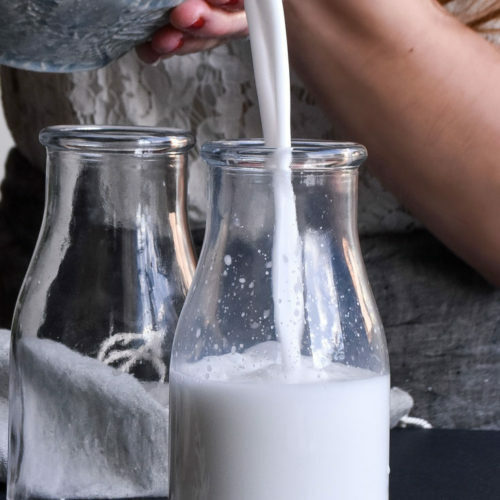 I’m bubbling over with excitement to share one of my favorite low carb recipes with you guys: how to make coconut milk! 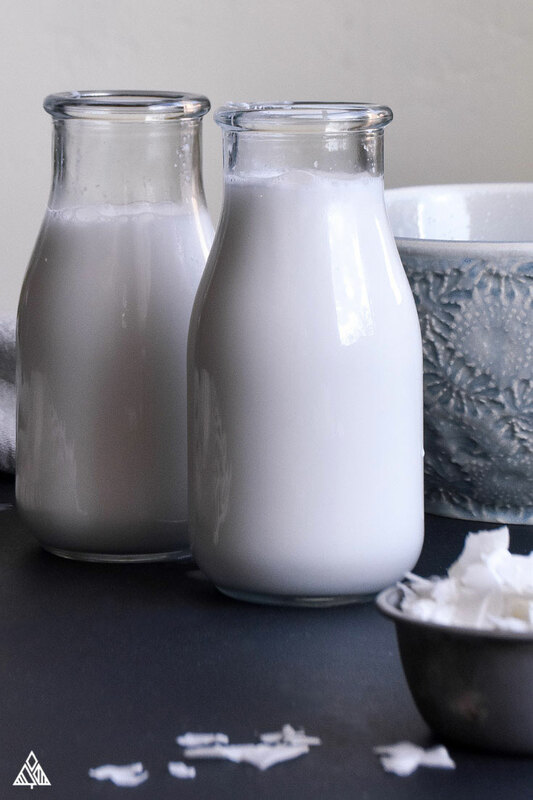 Homemade coconut milk is simply the best—after all, how many drinks on your low carb food list could you make while stranded on a deserted island? Coconuts are chock-full of powerful vitamins, minerals, fiber, and other plant-based nutrients that everyone’s diet could use a little more of. Plus, the luscious and refreshing taste can bring you a moment of tropical paradise, even if you’re sitting at your cubicle on a Monday afternoon. Are you ready to get cracking with our easy to follow how to make coconut milk guide? Coconut milk is the liquid extracted from the delicious white meat of coconuts. Coconut milk is very different than coconut water—which is found in the center of immature green coconuts. The two types of coconut milk recipes are for thick and thin coconut milk. This recipe is for thin coconut milk. Thick coconut milk is a high fat, high calorie food with a whole lotta delicious flavor and creaminess. You can easily grab a can at the store (or on Amazon), just be just to read the nutritional labels for added sugar! For a nectar of the gods, homemade coconut milk is surprisingly easy to make! I like to keep my recipe easy, cost-effective, and delicious—so I stick with ingredients that’re easy to find and take far less prep! 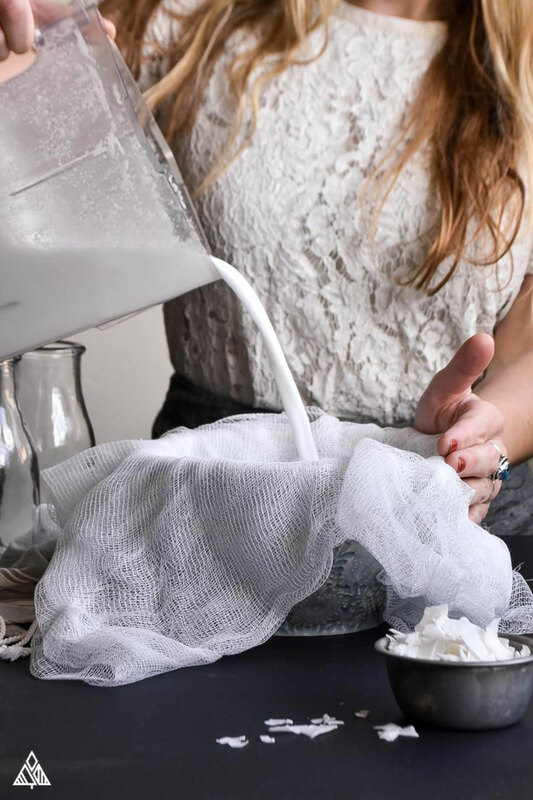 Side note: I far prefer this method over the fancy, time consuming and expensive DIYs for how to make coconut milk from fresh coconut, how to make coconut milk from coconut oil, and how to make coconut milk from coconut cream—let me know what you think in the comments below! For the creme-de-la-creme of homemade coconut milk, I recommend using full-fat, unsweetened, shredded coconut, which is widely available at health food retailers. Simply soak shredded coconut in water, blend, strain, remove pulp and enjoy your milk! Check out this video, we’ll be doing the same thing except with coconut! 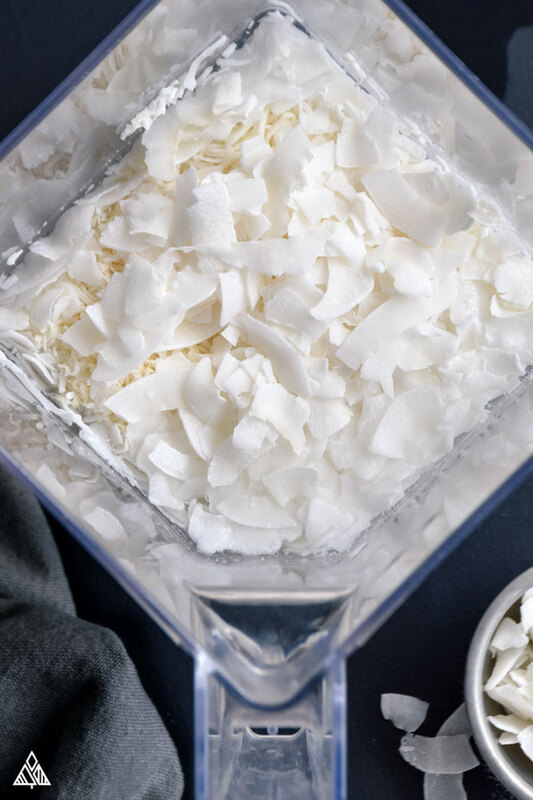 First toss your shredded coconut into a blender with 4 cups of water. Let that bad boy soak for to 2-4 hours. If it soaks more or less than that, your milk may come out tasting bitter or funky; Consider yourself warned. I suggest occasionally stirring the ingredients as the shredded coconut tends to float to the top of the mixture. After everything soaks, blend away! Starting on a low speed, then gradually working your way up to high speed—once there let the mixture blend for 1 minute. Now, it’s time to strain: Prep your nut milk strainer bag (which I strongly recommend) or cheese cloth laying inside of a mesh strainer. Place whichever you’re using inside a big bowl. Pour the blender contents inside the bag or cheese cloth. Place the pulpy contents to the side—you can make coconut flour with this goopy, glorious stuff. Check out our how to make coconut flour instructions. Quick tip: since there are no preservatives in the milk, it may separate in between use. That is perfectly natural, just shake or stir before drinking for the perfect sip in every serving. 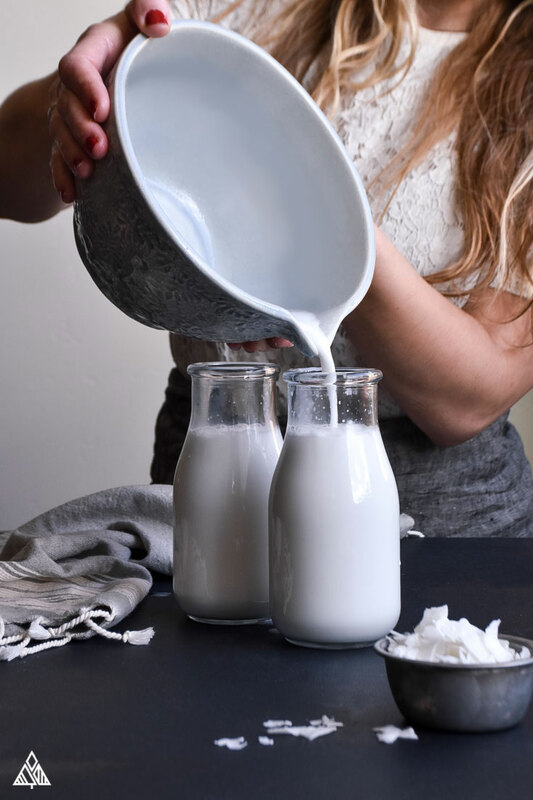 If you’re adding any goodies to your milk, place the strained milk back into the blender with whatever you choose to add. “Pulse” the milk 10 times, or blend the milk on low speed to thoroughly mix ingredients. Enjoy!! I’d seriously get carpal tunnel if I tried to type out all the fabulous, delectable coconut milk recipes and low carb drinks you can create starting with this recipe as your base. And yes, before you ask, pina coladas totally count! For the miserable morning after your pina colada party, you gotta try my favorite golden milk recipe—a warmed glass of homemade coconut milk spiced with turmeric, ginger, pepper, and cinnamon. Yum! My personal favorites are this blueberry smoothie and this low carb strawberry smoothie—if I’ve been glutinous, I go for this anti-inflammatory smoothie. Before I drive you *nuts* (last one, I promise), allow me to introduce The Little Pine’s quick-reference coconut milk recipe! How to make coconut milk with just 2 ingredients, so you can enjoy a dash of tropical paradise to your morning coffee! Place your shredded coconut in the blender and pour 4 cups of water over the top. Let this soak for up to 2-4 hours. If it soaks less/longer it can ruin the taste of the milk/flour! I suggest occasionally stirring the ingredients, as the shredded coconut tends to float to the top. Now its time to blend. I have a BlendTec, so I press “Whole Juice” once and the blending is done. If you are working with a Vitamix or regular blender, start on low then work your way up to high speed. Once you get to high speed let the mixture blend for 1 minute. Place the nut milk strainer bag into the mesh strainer. 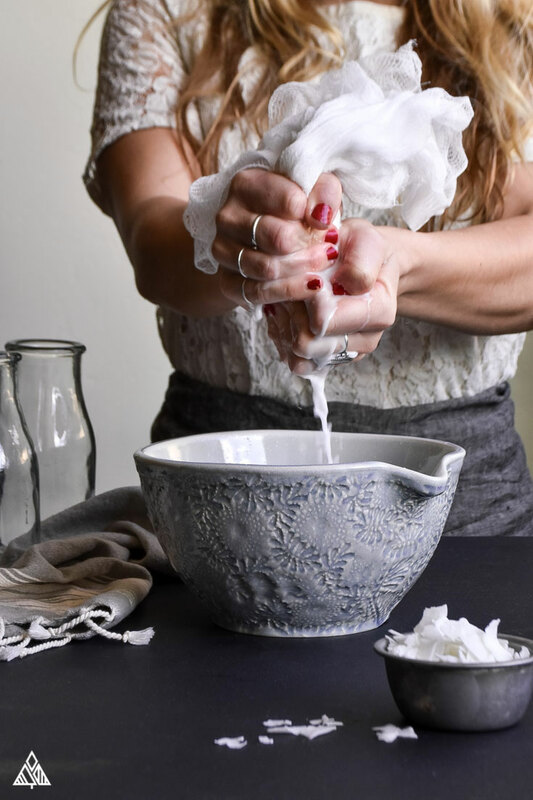 If you are using some form of cloth instead (such as cheese cloth), you want to make sure it extends to the top of the strainer so you can grab the ends of the cloth once you have poured the milk in. Place the strainer over a pot or bowl. Pour the contents from the blender into the cloth/strainer. The liquid we strained into the pot is coconut milk! Move the strainer and milk nut bag to the side (You can make coconut flour with this! Click here for instructions) and pour the contents of the bowl into a container and into the fridge. Since there are no preservatives in the milk, it may separate in between use. Make sure to shake or stir before drinking. Enjoy! 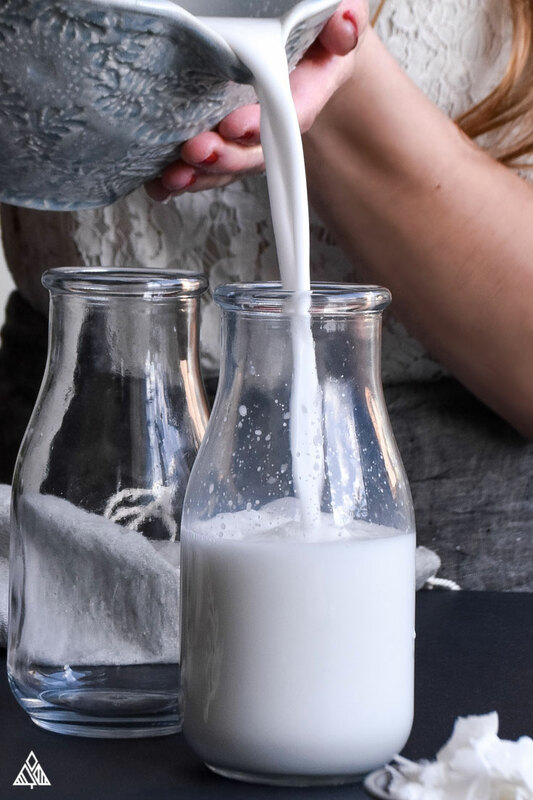 Coconut milk is a tempting option when search for low carb milks, but it’s certainly not the only milk option available!